Today was perfect. Sunny, light breeze, 60 degrees. Today paid for all those cold, wet, sloppy days where I griped and complained. I take it all back. Today we took advantage of the gorgeous weather to tackle some over-due jobs. Number one on the list: alpaca toenail trimming. Because it had been so long, the boys had forgotten some of their halter manners and the job took a bit longer than I expected. But all in all, it went pretty well. Shareholder Chris did an awesome job of taking pictures, handing us stuff, and even walking the boys around the pen after each one got his pedicure. Little Boaz surprised her, however, and sent her tumbling when he jumped up into the air during his trim. Fortunately, she is a super good sport and promised not to hold it against us. She took Jonah on a little walk after his trim to remind him what this civilized halter stuff is all about. 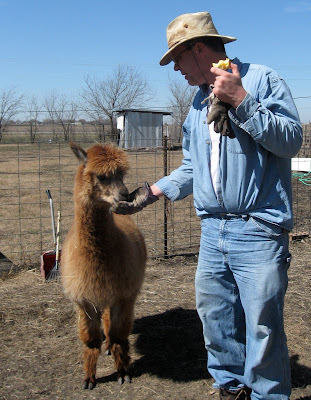 Ted is known to the alpacas not only as Mr. Toenail Guy, but also as Treat Man. Moonstruck is first in line for some apple bits after his pedi appointment. Good news for our Chicken Sponsors. The little girls aren't so little any more. They are starting to lay, and more and more of them have ventured out into the pasture to start their Free Range careers. At least half of them have spent some time on the outside. I'm a proud momma. In just a few minutes we'll close the entries for our photo contest. Several more folks submitted shots today, so those will go into the judging pool. Great, great work, everyone! I'll keep you informed about how the judging goes, and we'll have a big announcement when the winners are chosen. Sorry I could not make it, but I was able to have a good Saturday for the Terminex Man to come and treat the yard and the house all at the same time. :) Hopefully keep the fleas at bay!! Saturday was a gorgeous day! Glad you were able to get lots done. Love the chickens!